Identify what is to be stored and provide appropriate, conveniently located storage space in each case. 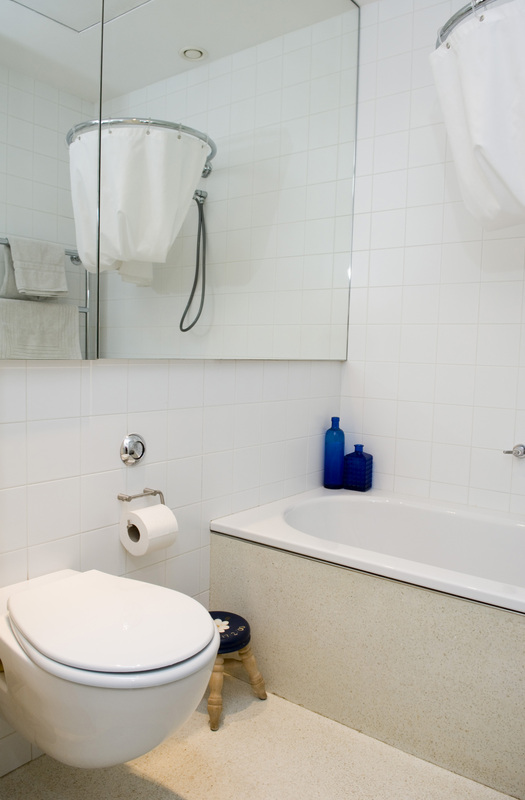 Your home will still get messy from time to time but at least each item will have a “home”. 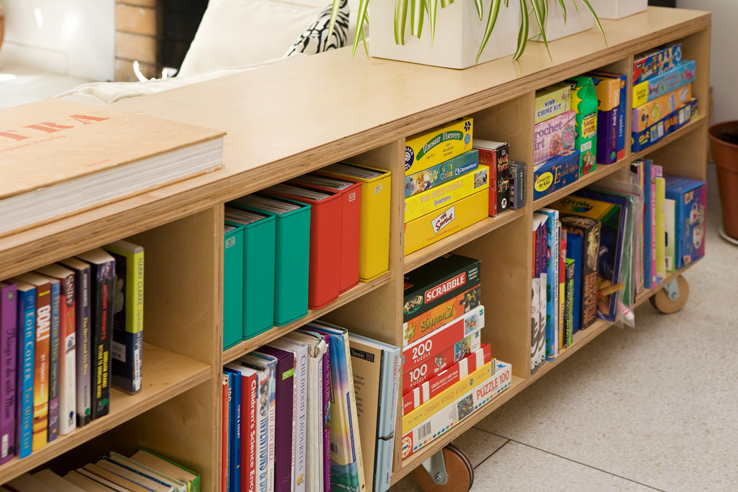 Adjustable shelving will maximise the usefulness of most general-purpose shelved areas. Provide full height access to Hot Press, cupboards and storage areas where possible – a normal door means a lot of the area at high level is effectively inaccessible. Hot Press/linen storage shelves work well with shelves 30cm apart in height. Laundry topples over more easily where shelves are farther apart. You will fit in more shelves and more items. Shelves 45cm deep are useful here. Any deeper than 60cm here means scrambling for things at the back. 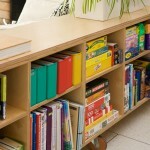 30cm is a useful depth for bookshelving, this will accommodate large files and books also. 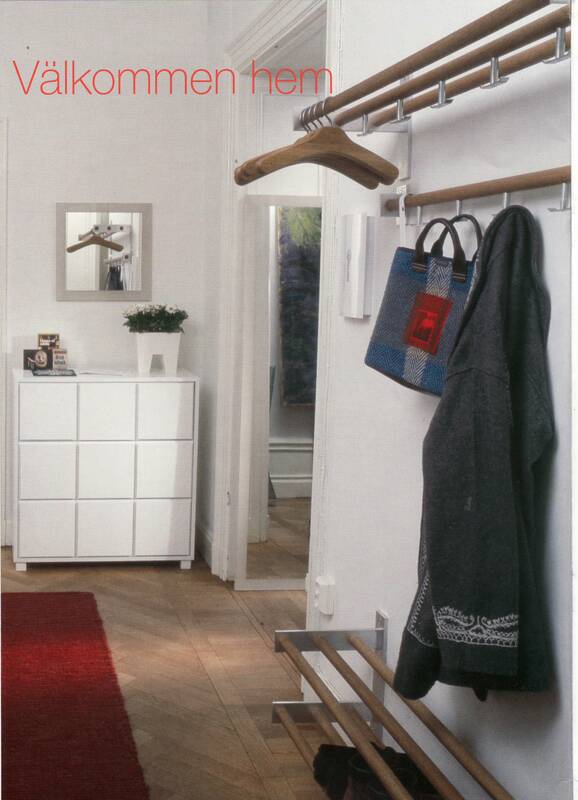 34cm is a good height between shelves vertically: you will need this height to accommodate lever arch files..
Coats and jackets are more usefully stored on hanging rails, not hooks, where overload occurs easily. A rail needs to be placed in a space 60cm deep. Where hooks are unavoidable, always fit double hooks, twice as useful as single. 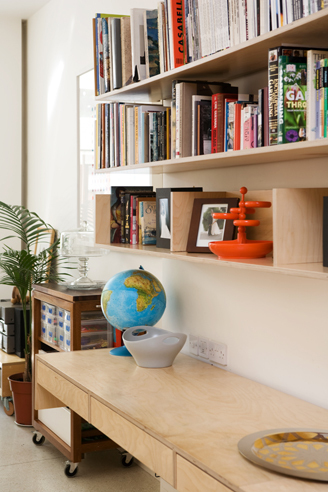 For general storage, avoid shelves or drawers that are too deep – 30cm is a good all round useful depth. Any deeper means scrambling for items at the back. Dividers will be useful where deep drawers are unavoidable. 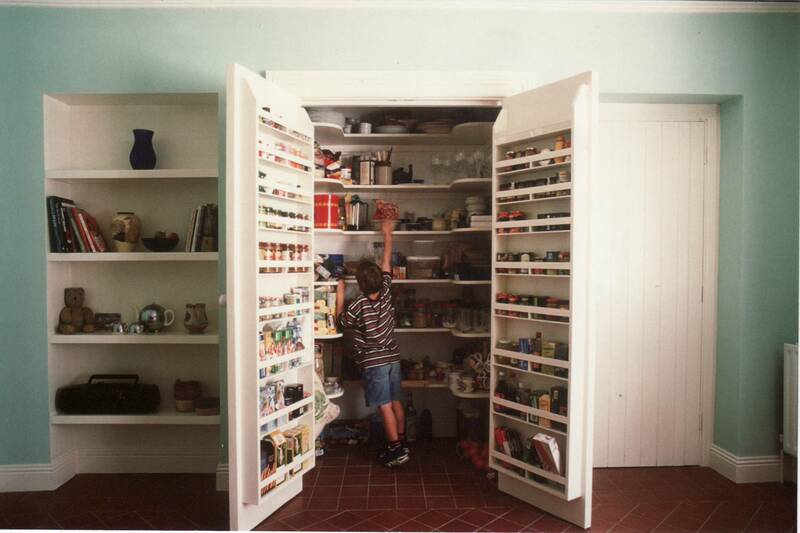 For toys, consider open shelving with loose items in tubs and baskets, the model empolyed by most schools and creches. This means that children can see the toys easily, while each item has a home to return to when not in use. 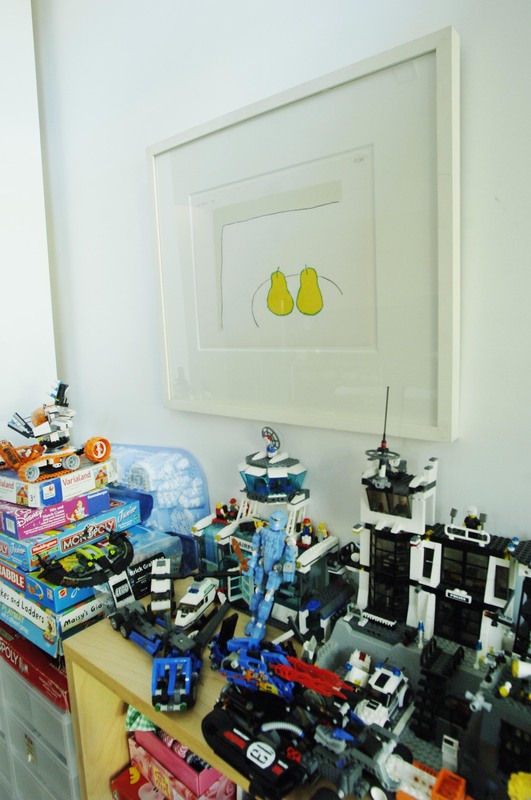 Smaller children naturally gravitate towards adults, so try and facilitate at least some toy storage and play space in or close to the kitchen. Storage space starts in the Hall where shallow, birch ply drawers house keys, gloves etc. The unit is 134cm wide x 35cm deep x 15cm high. 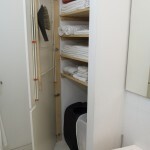 Mirrored doors above the concealed cistern in the Guest Toilet/Cloakroom conceal shallow adjustable shelves, 19cm deep, for cleaning materials, dog food, gardening supplies etc. 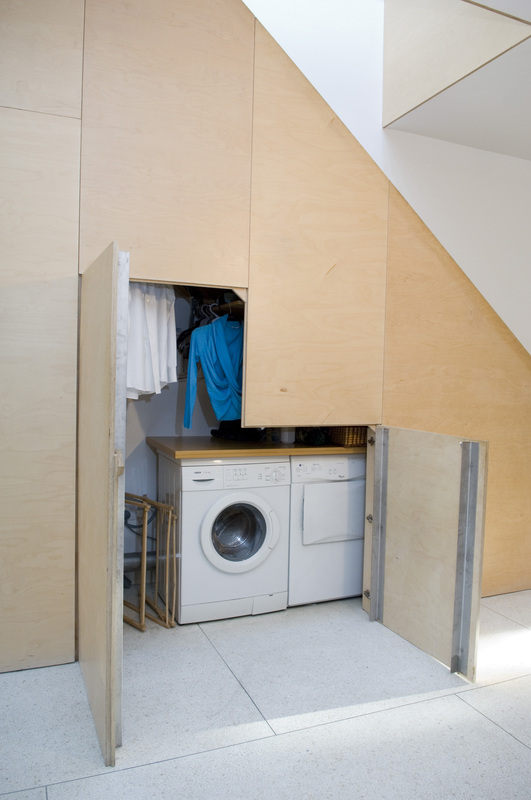 The under-stairs area is shelved to maximise storage space, as well as acting as a Laundry zone. Custom made birch ply furniture throughout the ground floor area facilitates general storage also, all on castors for optimum flexibility. Many items are double-depth and accessible from two sides to maximise usefulness, including a bookcase (200cm x 40cm x 75cm) which divides the sitting and central areas and a low level drawer unit. 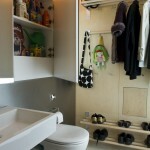 The low height of these units makes them easily accessible to children also. 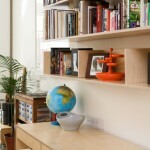 Furniture made for previous homes in iroko and painted mdf has found new uses. 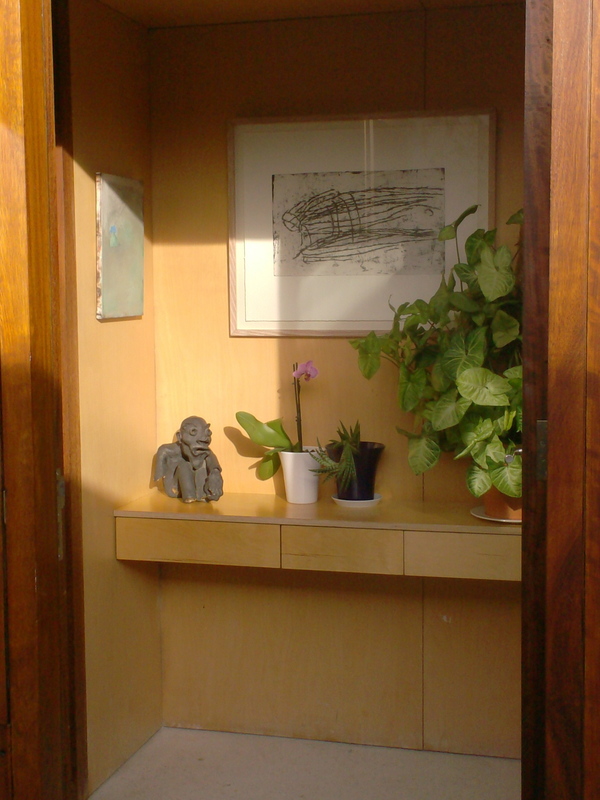 A piece designed originally as a mobile unit for a small kitchen now houses art materials (80cm x 40cm x 96cm). 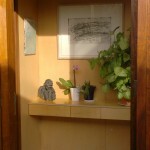 A built-in desk in the central area measures 60cm deep x 130cm deep and accommodates drawers under also, in the manner of an old-fashioned kitchen table, for stoarge of stationary, paper etc. The 3 shelves overhead are fixed, as an adjustable shelving system would have been unsightly in this location. The bottom shelf is kept clear of books and reserved for photographs and precious items: shelves packed solidly with books can be overwhelming in a space other than a dedicated library/study area. 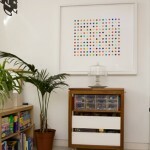 The shelves are 28cm deep and 32cm apart vertically. 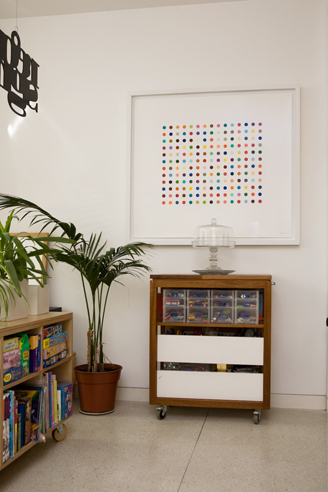 Toy storage centres around an open shelved unit from Habitat in the Family area, 157cm wide x 33cm deep x 111cm high. Loose items are stored in large plastic tubs. 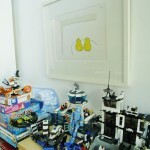 Multi-drawer plastic units from Muji, which also have dividable inserts, have proved invaluable for storing lego and other tiny items. They each measure 26cm wide x 32cm high x 37cm deep. Concealed shelving to the side of the wide chimney breast in the kitchen houses unsightly household files, telephone directories etc. The younger the children, the larger the toys it seems. 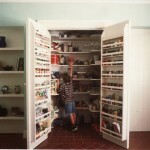 We stored large items in their bedroom, where possible, to avoid the whole being overwhelmed with plastic. Overflow toys are currently stored in the TV Room/Study at first floor level. 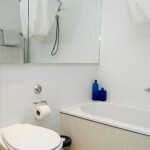 Mirrored doors in the bathrooms conceal deep adjustable shelves for toiletries and towels. 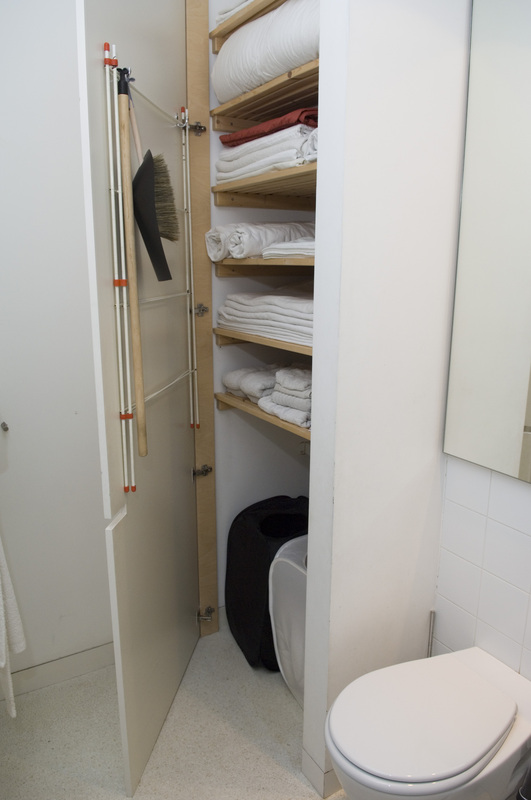 A full height door gives access to an 80cm wide linen cupboard in the bathroom, with fixed, slatted shelves 48cm deep and 23cm apart. 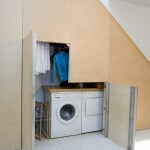 The bottom shelf is positioned at 100cm above the floor so as to allow 2 laundry baskets be located underneath. Bath-time toys area accommodated in coloured tubs below the sink. 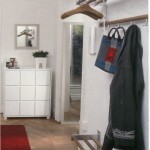 Wardrobes are designed specifically for each room, with a certain amount of full and half-hanging in each. 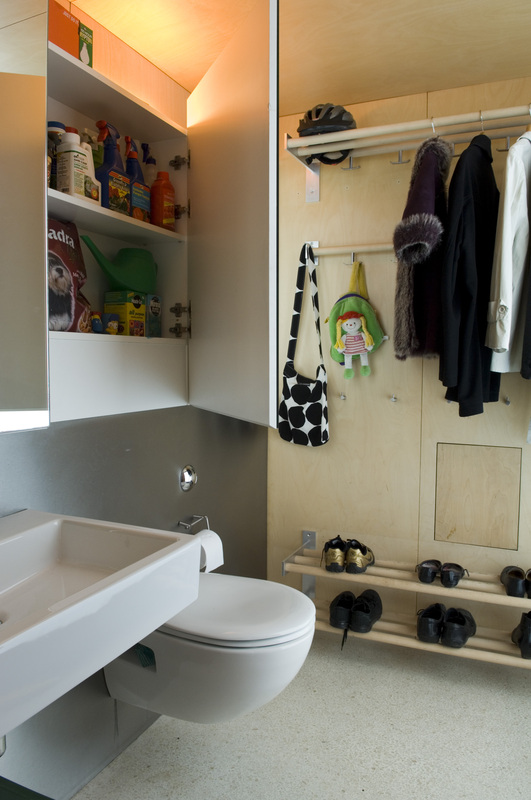 Are you looking for storage space ideas or advice for your home? See the houseology services for more information on how we can help or get in touch with us straight away!